Without a doubt you have probably seen many advertisements on TV and online which emphasize the importance of your credit rating. While these advertisements may be a bit of an exaggeration, your credit report is never-the-less important as it details accounts which have been opened in your name. As such, it is a good idea to periodically review your credit report as any suspicious activity could be an indication of identity theft. On that note, did you know that US law entitles you to free credit report from each of the three major reporting bureaus every year? Here we will walk you through exactly how to get them. AnnualCreditReport.com is the ONLY authorized source for the free annual credit report that’s yours by law. 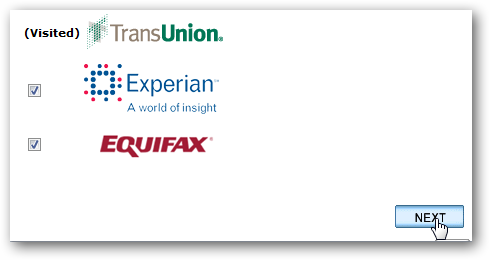 The Fair Credit Reporting Act guarantees you access to your credit report for free from each of the three nationwide credit reporting companies – Experian, Equifax, and TransUnion – every 12 months. The Federal Trade Commission has received complaints from consumers who thought they were ordering their free annual credit report, and yet couldn’t get it without paying fees or buying other services. TV ads, email offers, or online search results may tout “free” credit reports, but there is only one authorized source for a truly free credit report. It is important to note that you are getting credit reports from the reporting agencies, not a credit score. Your credit report simply shows you a list of past and present accounts in your name (which should be consistent across all three agencies) while your credit score is numeric representation of this information and can vary between the different agencies, depending. So essentially you are getting the information behind the score, but not the score itself. If you want to see your credit score from any or all of the reporting bureaus, these are not free and would have to be purchased individually. Overall the process pretty intuitive, however as you navigate through each of the credit agencies, you are presented with upsell links to purchase either your credit score or credit monitoring. As we go through the sites, we will highlight areas which attempt to sell you to these (non-free) services. Prior to starting this process, we highly recommend having a PDF printer on your system so you can save a copy of your credit reports for your records. If you do not already have one installed, follow our guide for installing a PDF printer first. 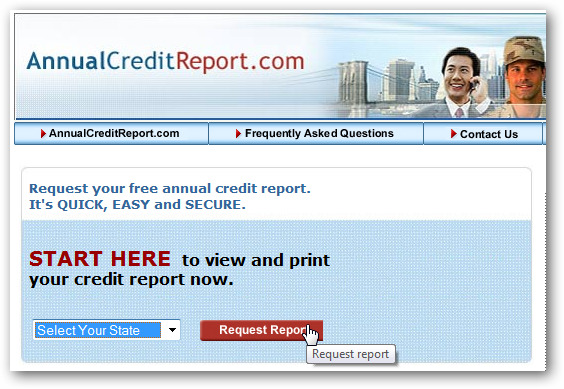 When you go to AnnualCreditReport.com, select the state where you current live and click Request Report. 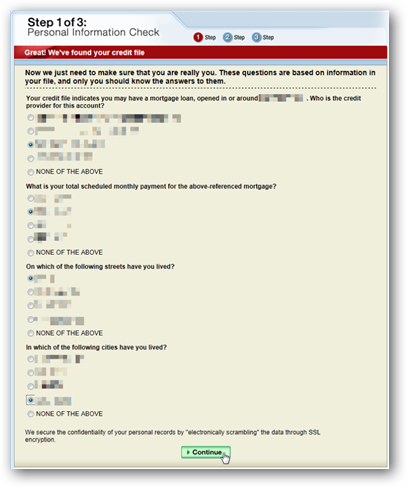 You will need to provide some personal information so fill out the form and click Continue. For your convenience, this information will be automatically sent to each credit agency which you request a report from so you don’t have to retype it. 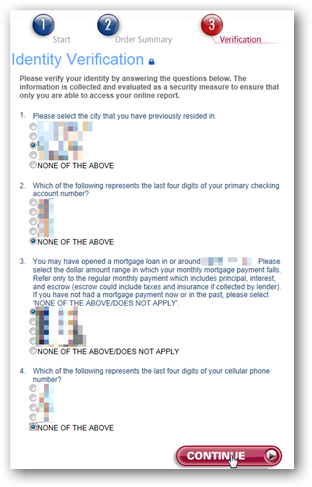 When prompted for credit bureaus, select all three and click Next. 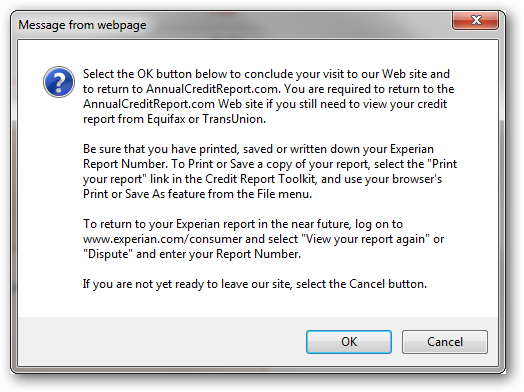 Before visiting the first selection, you will be prompted with a notice of how to navigate back to AnnualCreditReport.com from within the credit agency’s site. Click Next to get your first credit report. When you visit TransUnion, the information you see along the bottom in the “Information You Have Provided” section should mimic what you first entered in AnnualCreditReport.com. Verify this is correct and click Continue. Next you will be presented some security questions regarding your credit history. These are to verify your identity so answer them accordingly and click Next. Finally, you will get to the credit report. You can view this information here but we recommend you view the printer friendly version and save it to a PDF file for your records. Note: There are a couple of upsell links on this page. 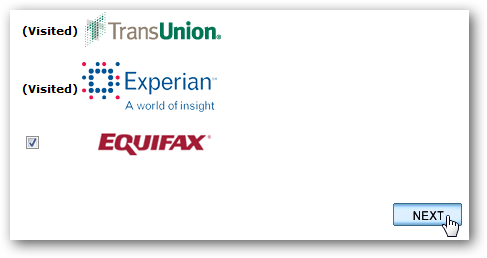 If you would like to get your credit score, remember it will only be for TransUnion. Once you have saved your credit report, click the Return to AnnualCreditReport.com link across the top. Again, make sure you have saved or printed your report before continuing. 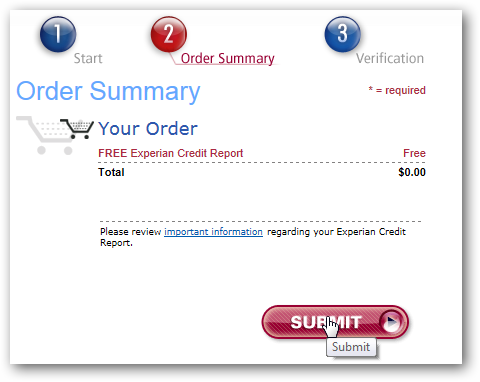 When you are transferred back to AnnualCreditReport.com, Experian is next on the list. Click Next. 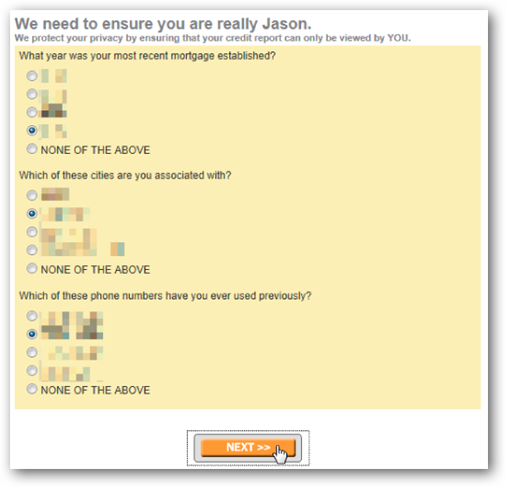 Experian will require you to initially identify yourself. Fill in the value as appropriate and click Submit. 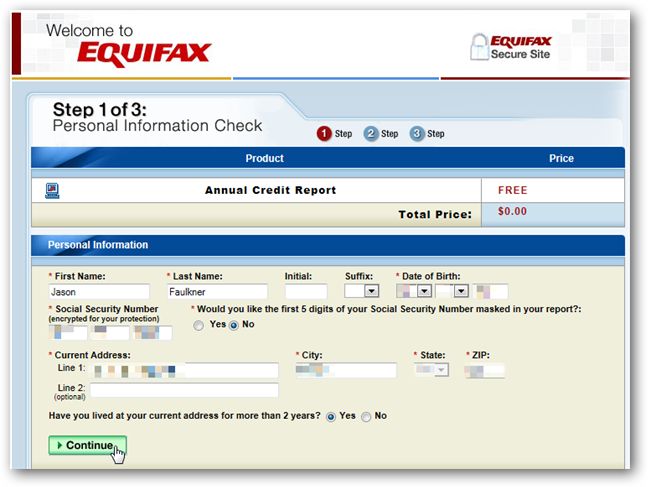 On the first step of the wizard, click Annual Credit Report. 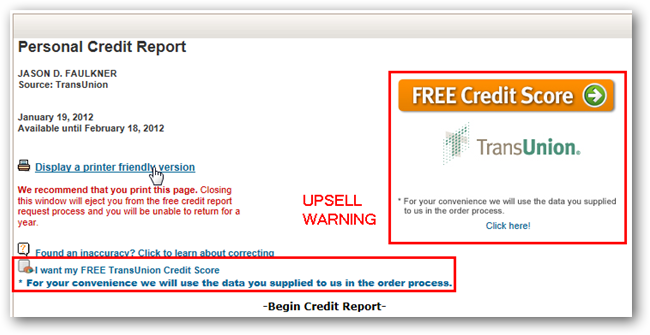 Step 2 will confirm your order for the free credit report. Click Submit. 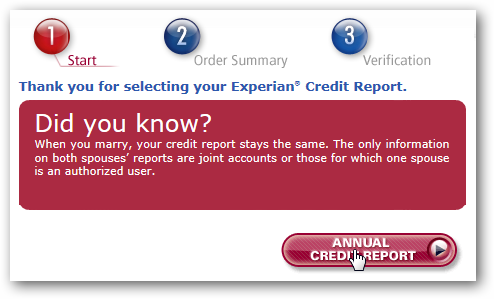 As the final step, Experian will ask a series of verification questions regarding your history. Answer these appropriately and click Continue. On the summary page, click the “Print your report” link on the right side. This will open a new window containing your credit report for review. We recommend saving this to a PDF file for your records. Note: There are upsell links along the bottom. Again, make sure you have printed or saved your report and click OK. 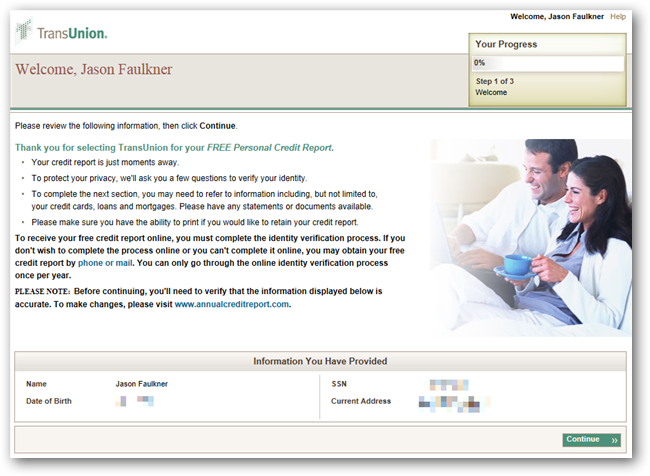 The final credit bureau, Equifax, will be selected when you return to AnnualCreditReport.com. Click Next. 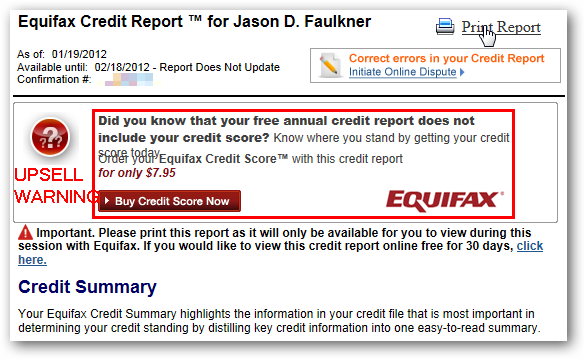 Equifax will mirror the information you first entered on AnnualCreditReport.com. Verify this is accurate and click Continue. The first step will ask the security questions. Answer these and click Continue. 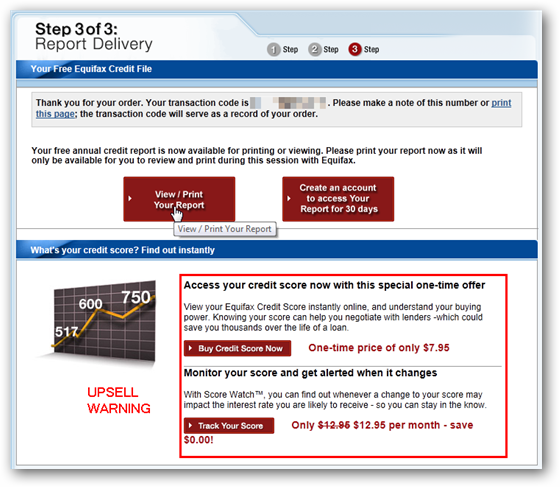 Step 2 will confirm your order for the free credit report. Click Submit Order Now. On the final step, you are presented with the option to view your report. Click the View / Print Your Report button. 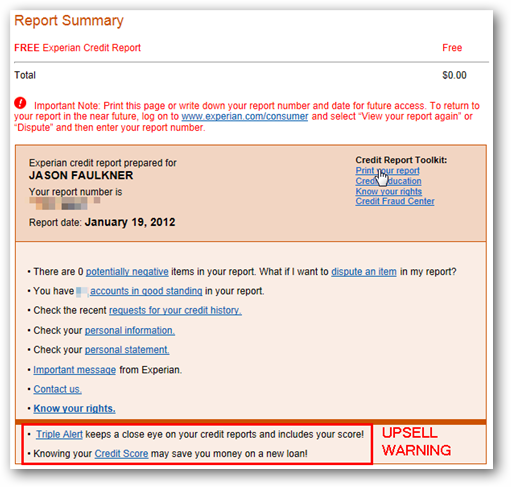 Note: There is an option to create an account as well as upsell link for your credit score and monitoring. 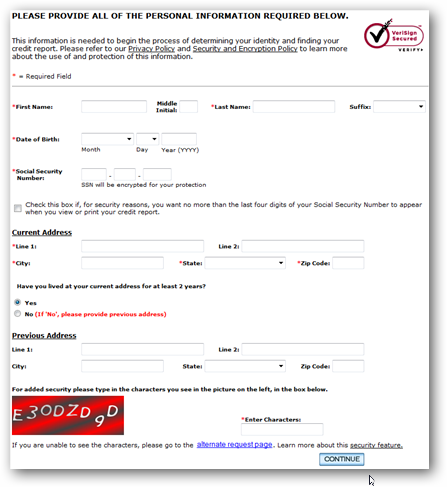 Again, keep in mind this is only for Equifax. In the View/Print report screen, click the “Print Report” link. After reviewing your report, be sure to save it to a PDF file for your records. 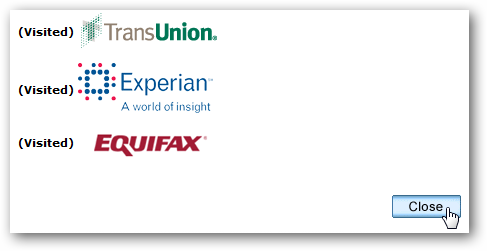 Note: There is another upsell link on this page to purchase your Equifax credit score. Once you have saved your credit report, click the Return to AnnualCreditReport.com link across the top. You will not get a warning notice after clicking this link so be sure you have printed or saved your report. AnnualCreditReport.com will now show you have visited all three reporting agencies. Click Close to finish. Keep in mind, this process can only be run for free once a year. Be sure to mark your calendar for next year so you will know the next time you are due to run your free reports.